Having a dirty and dull looking tile flooring is the matter to worry as it impacts the value of your property. Therefore, to clean it regularly with non-toxic solutions it is essential to prevent your tile flooring from damaging. Today, tile and grout cleaning service is in great demand as people are looking to have a neat and clean property. Having said that, several individuals have misconceptions about tile and grout cleaning which causes long-term damage to flooring. 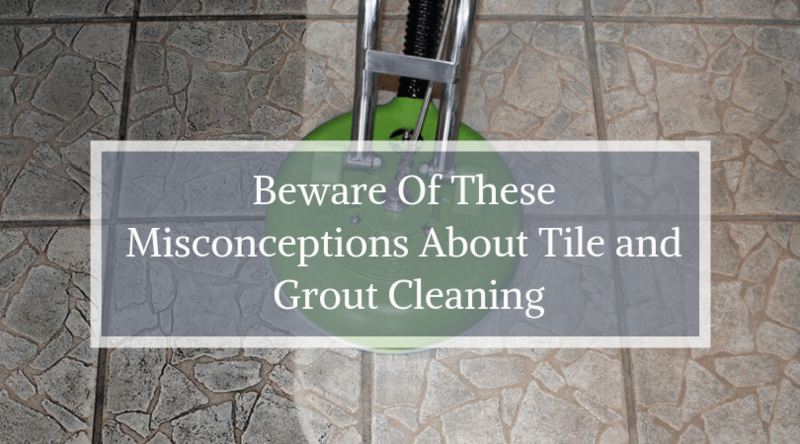 This blog is all about revealing the facts about these misconceptions and clear all your doubts on how to clean the tile and grout efficiently and safely . Hence, consider these myths with its facts when it comes to cleaning your own tile flooring. It is true that sealing your grout is the part of tile restoration. But, it is a misconception that it removes the need for cleaning. With regular cleaning and professionally sealing your tile, you can eliminate the amount of effort involved. But, the wear and tear damage the sealed grout in some areas of flooring. Therefore, it is advisable to clean the sealed grout to ensure that it is in perfect condition. Yes, with scrubbing stain and dust get away from the tile flooring. But, thinking of hard scrubbing your stained area over the grout is a bad idea. It can damage your grout sealing and make the space for the dust to enter the porous area. Hence, rather than wasting your time and effort on scrubbing your tile flooring, it is best to call professionals. This is a common scenario when after mobbing or washing clothes on the tile floor, individuals left the tile flooring with soapy water. These can cause you long-term damage and costly repairs. Yes, it is true! The detergent solution mix with water can loosen the dirt particles inside the carpet. But, along with that, it also attracts other dirt tiny particles once the solution is dried. The dirt will stick to the dried solution and accumulates, leaving your carpet dirty and dull. Hence, it is suggested to clean your tile floor regularly once the daily routine work is completed. Professionals – The True Savior Providing Quality Tile and Grout Cleaning! If you want to save both time and effort on cleaning tile flooring while getting shiny look, then choosing professional tile and grout cleaning service is beneficial. One of the reputable tile and grout cleaning service provider is All Pro Carpet Care. From eliminating dust from your carpet to restoring its original look, we are your helping hand. We provide our cleaning services for all individuals living in Bakersfield and nearby areas. To know more about our services or cleaning offers, contact us at 661-747-4441 or you can also follow us on Facebook, Twitter, Instagram, and LinkedIn.